I don't know about you, but we have some Shabbatot that we "name" or call by a particular name. It might be something as simple as Rocker Shabbat, where we may all spend Shabbat wearing rocker wigs...mullet-style, Tina Turner style, red-wild-sparkly. It is fun to experience Shabbat from a rock star prospective and the kids really enjoy it. It may be something such as Game Night Shabbat where the entire evening we play games. Red light-green light. Life. Chutes and Ladders. Card games. Drama/acting games. We also have a Teen Shabbat -- I am sure I don't have to explain that one! Soon we will have a Spooky Shabbat. Not every Shabbat is themed; in fact, we hardly ever do that but when we do, it is always fun. This past Shabbat, we had our Chili Shabbat. 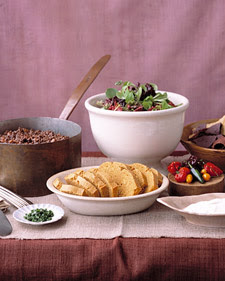 Veggie chili, cornbread, salad...mmmmmmm! There are times when it is only appropriate to eat chili and cornbread! In our family, we like to add malt vinegar, grated cheese, and a dollup of sour cream. Of course, I skipped the cheese and sour cream this time. Other food themed Shabbatot we have are Taco Shabbat, and VLT Shabbat. I don't know what I did with my life or how I organized my week before I started celebrating Shabbat. It has become the single driving force of my week, this special gift of Shabbat. Once again, we are food twins! We also had vegetarian chili Shabbat! We love ours with Scoops (T. Joe's brand) and cheese. We also had yummy salad and I made Baba Gannosh (spelled it wrong, I know) -- homemade! YYYYUUUUMMM!!!! Boy do I look forward to our Friday nights!